Recently I wrote a Focus report on Grand Reve Vintners. In that post, I mentioned that the winery was looking forward to its first vintage of estate fruit this year. 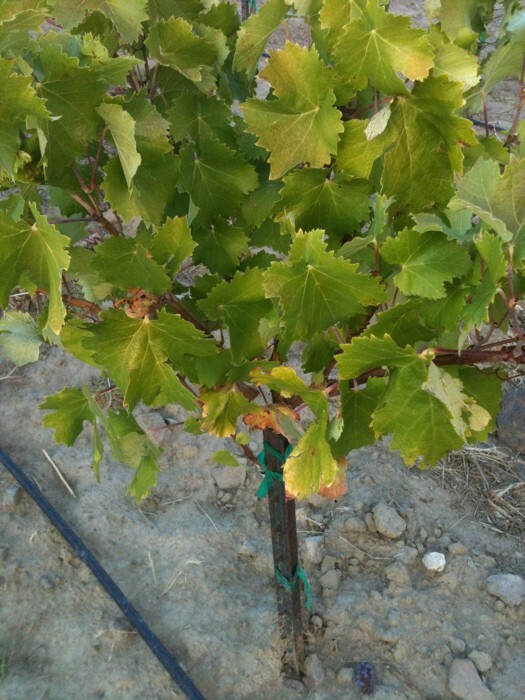 Wednesday evening the shocking news came across Twitter from vineyard manager Ryan Johnson that the winery’s first vintage of mourvedre grapes had been stolen (the picture here was tweeted by Johnson showing the vines stripped of their grapes). Approximately 1.25 tons of grapes were taken; about one hundred to two hundred pounds were left. Ironically, the grapes stolen were more than a week away from being ripe. According to reports the grapes amounted to $4,000 in lost revenue and potential wine sales equating to $30,000. Sadly, when I spoke with Johnson earlier this year, he was especially excited about the potential of these particular grapes. The winery is offering a $5,000 reward for information leading to the arrest of the persons responsible. Anyone with information should contact the Benton County Sheriff's Office at 509-628-0333. For more information on the theft read articles from Wine Press NW, the Tri-City Herald, and KNDO. I really hope they catch whoever did this to Grand Reve's vineyard. It saddens me to see something like this happen in the viticultural community. TylerH, agreed. As I just wrote in my subsequent post, someone knows who did this, and it's time for that someone to come forward.